where all of the drivers are considered an extension of that family, and the customers as friends. Before Dale Braun created DKD Trucking, he grew up in Hecker, Illinois where he was surrounded by a family of truckers. William F. Braun, the milk hauler, was first cousins to Dale’s father, Raymond, who also had his own trucking business when he passed prematurely at the age of 51. Dale was only eight years old then, but continued to grow up with trucking in his blood. In 1981 after getting experience with hauling rock and sugar for other local companies, Dale bought his first truck, a 1978 Freightliner. He created a company called DKD Trucking, from the initials of his name, his new-born son, Kyle, and his wife and supporter, Debbie. Dale hauled fuel for 12 years, leasing on to other companies until he purchased his own trailer and applied for his own authority. 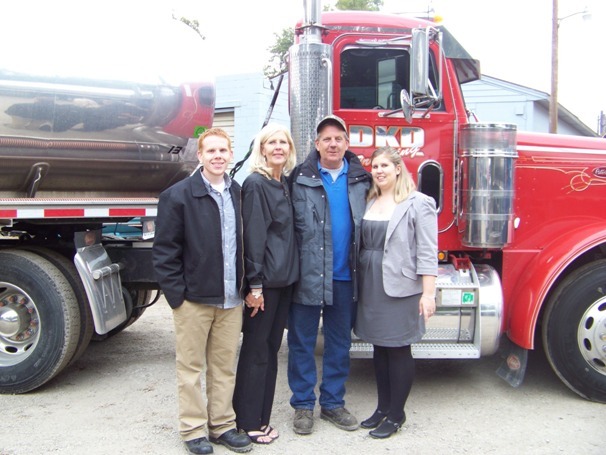 After his fleet grew to five trucks and tankers, Debbie, Dale’s wife, took this business as a full time venture and ran it out of their home office. She was thrown into trucking abruptly as DKD took off so quickly, so Debbie joined the Midwest Truckers Association for guidance. Several more trucks and 10 years later, the business grew too large for their home office, so they took the leap of purchasing a small truck company in South Roxana, IL. With that merger, DKD took on more gas business as well as something new to them, asphalt. Since that purchase in 2007, needing more help running the office, Kyle joined the company on a full time basis bringing a Master’s in Business degree to the table. Ashley, Dale and Debbie’s daughter is also part of the company specializing in human resources with her two business degrees. Another great asset to DKD is Alan Oertel who became part of the group in 2007 after the buyout. Al has been working on trucks for more than 30 years, and is an integral part of keeping the fleet safe. Dale, who is a blue collar owner, can be found most days full of grease under a truck alongside of Al. If he’s not in the shop, he is helping out by jumping in a truck on busy days to ease the workload on his crew. The size of Dale’s fleet which started out with that one lease truck has grown to a team of drivers hauling fuel, asphalt, calcium, and more. With their growing size, DKD strives to maintain it’s small family run roots at heart where all of the employees are considered an extension of that family, and the customers as friends.